"In the search for love, truth and justice a good vamp never hurts. That's the modus operandi of Meshell Ndegeocello." "The versatile Meshell Ndegeocello… confidently and creatively blends funk, rock, R&B, jazz, soul and ambient strains into a personal explosion of worldly realities and otherworldly desires." ★10 time GRAMMY Nominee - performed at the GRAMMY Awards broadcast from Madison Square Garden (1997). ★Meshell has released 10 albums since 1993. She was one of the first artists signed to Madonna's Maverick Records, which released her first 5 albums. ★July 2012, Meshell featured in a tribute to the life and music of Curtis Mayfield along with Mavis Staples, Dr. Lonnie Smith, William Bell, Sinéad O'Connor, The Roots, and Kyp Malone and Tunde Adebimpe of TV on the Radio. ★May 2012, Meshell spoke on PBS's News Hour about the importance of the Arts in Education. 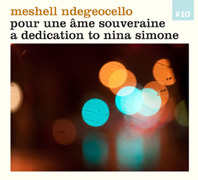 ★January 2012, Meshell featured on KCRW's Morning Becomes Eclectic and Late Night with Jimmy Fallon. ★October 2011, Meshell featured performing "God" on The 30th Annual John Lennon Tribute, Live from the Beacon Theatre to benefit the Red Cross' tsunami relief efforts. ★Meshell's music has been featured on film soundtracks including Batman & Robin, Love Jones, Money Talks, Down in the Delta, How Stella Got Her Groove Back, The Hurricane, Love & Basketball, Standing in the Shadows of Motown, Talk to Me and Soul Men among others. ★Supported The Who's Quadrophenia shows at Madison Square Garden, as well as supporting tours with both Sting and Dave Matthews Band. Television appearances include: Late Night with David Letterman, The Tonight Show with Jay Leno, Good Morning America, The Chris Rock Show (HBO), Sessions At West 54th, New York Undercover (Fox), Politically Incorrect with Bill Maher, MTV's Loveline, The Rosie O'Donnell Show, VH1 Honors, MTV Video Music Awards and MTV Movie Awards with John Mellencamp, In Living Color (FOX), The Arsenio Hall Show and Last Call with Carson Daly among others. ★Meshell was the first woman to be featured on the cover of Bass Player magazine in April 1995. She was featured on the cover for the second time in November 2007. Festival appearances include: Glastonbury; Neil Young's Bridge School Benefit; Estádio do Pacaembu Free Jazz Festival (Brazil); toured twice with Lilith Fair; Nice Jazz Festival (France); Montreux Jazz Festival; Pori Jazz Festival (Finland); North Sea Jazz Festival; Bumbershoot Music Festival (Seattle); WOMAD Festival; Westport Festival (Germany); Copenhagen Jazz Festival; Monza Rock Festival (Italy); Montreal Jazz Festival; Essence Music Festival (New Orleans); Newport Jazz Festival; KCRW's World Festival at the Hollywood Bowl; Wiesen Jazz Festival (Austria); JVC Jamboree Jazz Festival (Poland); San Francisco Jazz Festival; Pride Texas Festival (Austin); SF Pride (San Francisco); Calgary Folk Music Festival (Canada); Blues & Ritmes (Spain); Banlieues Bleues (France); Stockholm International Jazz Festival; Vancouver International Jazz Festival.